To walk down a street in a town like Midland, Mich., these days is to witness mass carnage  ash trees, long a favorite of city arborists for their tall silhouettes and abundant foliage, have been cut to the quick, leaving nothing but row upon row of stumps and a scattering of sawdust behind. A voracious beetle known as the emerald ash borer, first discovered in Detroit in 2002, has been gradually spreading, leaving a trail of destruction in its wake. The infestation has already killed some 60 million ash trees in 15 states as far east as New York, which just launched an ash-borer-awareness program, and as far south as Tennessee. The toll of dead trees will likely surpass those felled by Dutch elm disease by the end of this year. "It is now the most destructive forest insect ever to invade North America," says Deb McCullough, an entomologist at Michigan State University. "We literally cannot keep up with it." With ash-borer season in full swing  the beetles mate and lay eggs in May and June  we turned to the leading experts to find out more about the epidemic. The bug is native to China and likely migrated Stateside burrowed inside wooden shipping pallets. It has few predators in the U.S., which is one of the reasons the rate of the outbreak is unprecedented. But it is also very stealthy, because its larvae, which feed on nutrients just below the bark that keep the tree alive, are usually not visible until the tree is already in the ICU. (The mature beetles merely munch on leaves.) There are an estimated 8 billion ash trees in the U.S., all of which are vulnerable because, unlike the Asian long-horned beetle (which has spread to only four states in the 15 years since it was first discovered in Brooklyn), the ash borer is considered uncontainable. "It's causing complete mortality of ash trees," says researcher Dan Herms of Ohio State University, who notes that none of the 16 species of ash trees in the U.S. are resistant to the pest. 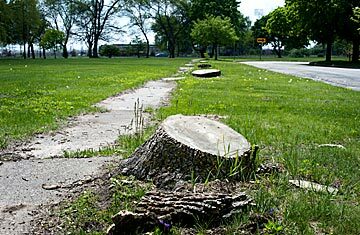 In the 1960s, American cities and towns began planting ash trees to replace those killed off by the Dutch-elm scourge. But this monoculture approach, in which block after block is lined with the same pretty tree, has made those same areas especially vulnerable to the iridescent ash borer. Fort Wayne, Ind., has already cut down 2,000 ash trees and will probably have to remove 1,200 more. Chicago can expect to treat or replace most of its 93,000 ash trees through 2020, spending as much as $46 million. All told, cities will spend more than $10 billion over the next decade to treat or remove infected trees, according to a recent study in Ecological Economics. (Treatment does not always stop infestation, but it does slow it down and therefore spreads out the cost of replacing dead trees.) Meanwhile, arborists are redesigning their treescapes: in Milwaukee, each residential block will now have up to four different tree types, including lindens, oaks, maples and hackberries. "We're trying to protect ourselves [for the future], so we won't have entire blocks with no trees," says the city's Forestry Services manager, David Sivyer. Efforts to thwart the winged invaders are also under way. Quarantines on transporting firewood that might be incubating the insects are widely in place. In eight states this summer, the USDA is releasing more than 150,000 stingless wasps, which were imported from the same forests in China where the ash borer occurs naturally and bred in a Michigan laboratory, that feast solely on ash-borer eggs and larvae. "These things are like little hunter-seekers  their whole mission is to go and find the emerald ash borer," says USDA scientist Jon Lelito. (The wasps, which look like tiny flying ants, actually lay their eggs either on the larvae or eggs of the ash borer. When the wasp eggs hatch as larvae, they then feed on the ash borers.) If that solution sounds a little ominous, Lelito says that the USDA has already done an environmental-impact study on the plan and is not concerned about the risk of introducing yet another foreign species into the U.S. As the ash-borer populations decline, so too will the number of wasps, until the two populations reach an equilibrium. "That's the advantage of biocontrol," he says. "There's nothing that lingers in the environment." See the top 10 invasive species.